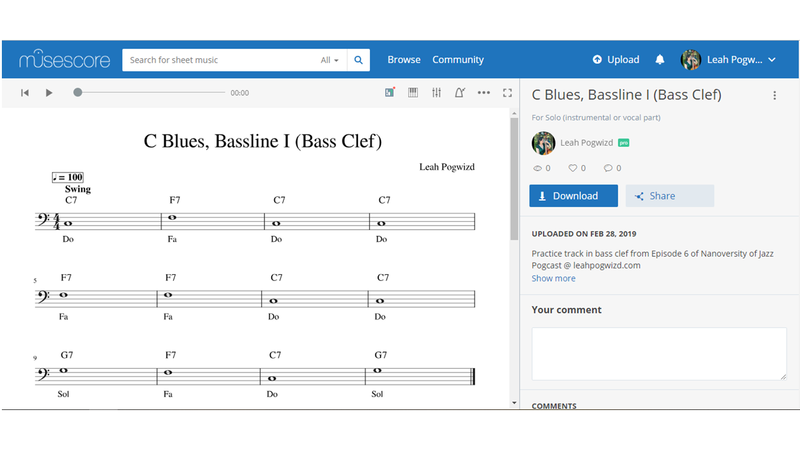 Summary: Learn roots and thirds for a simple 12-Bar C Blues Progression; plus – why you should document your practice in a journal or other medium! Transcript: Welcome back to Nanoversity of Jazz Pogcast at leahpogwizd.com! Each week, you’ll get a micro-lesson in bassline construction. In our last episode, we learned a roots-only bassline for a simple 12-Bar C Blues Progression. This week, we’re going to add chord tones – specifically, major thirds – for Bassline II. Last week’s key concept was that basslines (usually) use the root of a chord on beat 1 of each bar to provide rhythmic drive and harmonic definition. This episode’s main point is that basslines often use chord tones – such as thirds, fifths, and sevenths – on beats 2 and 3 of each bar. This helps further outline the chord changes. Each of the three chords in the C Blues Progression is a dominant seventh chord – meaning it contains a major third, perfect fifth, and minor seventh. This blend of major and minor intervals is what gives the blues its unique sound. Bassline II uses the major third of each chord. E is a major third above C, A is a major third above F, and B is a major third above G. Notice that some of the thirds are written a major third above the root, while others are written a minor sixth below it. They both have the same effect of outlining the chord. To practice Bassline II, sing and/or play along with the MuseScore tracks – linked in the video description. As always, I’ve included tracks in bass and treble clefs. This week’s tip is to document your practice in a journal or other medium. Write down dates, practice activities, and other information (such as tempos). Over time, you’ll organize your practice sessions and track your progress! That’s it for this week! Be sure to check out the blog at leahpogwizd.com and subscribe to the YouTube channel. Feel free to ask any questions or offer any feedback. Thanks for watching! It’s been a while since the last episode, but I’m happy to be back with a new format. I took the last few months to move across the country, recover from an injury, and train for a second career. I’m also sad to report that I lost Lola – the poster-cat for the Pogcast. For March 2019, we’re going to learn a series of basslines for a simple 12-Bar C Blues progression. This week, for Bassline I, we’ll learn the roots to this progression. The two main goals of a bassline are to provide rhythmic drive and outline the chord changes. One of the ways we do this is by (usually) playing the root of a chord on beat 1 of each bar. Bassline I outlines three chords – the I Chord (or “do” in Solfege), the IV Chord (or “fa”), and the V Chord (or “sol”). Before I talk about how to practice Bassline I, I want to show you how these roots fit into the circle-of-fourths. 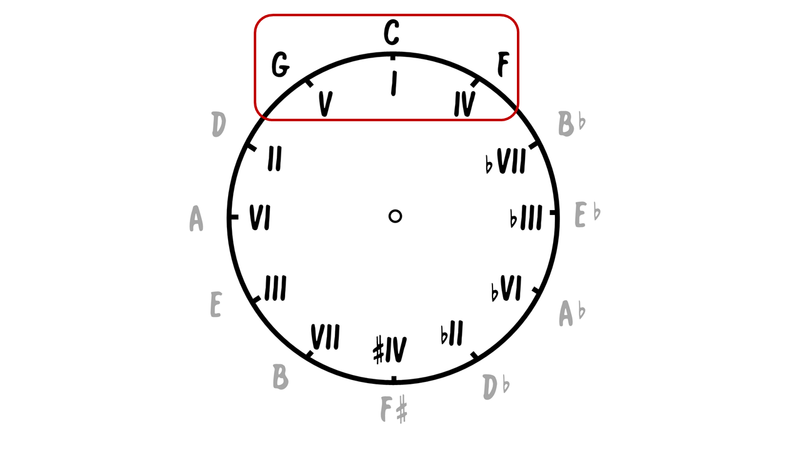 You can see here that the chords represent the top arc of the circle. G is a perfect fourth below C, while F is a perfect fourth above. To practice Bassline I, sing and/or play along with the MuseScore tracks – linked in the video description. I’ve included tracks in bass and treble clefs to accommodate various instruments. Each episode, I’ll end with a brief tip. This week’s tip is to practice basslines – even if you’re not a bassist. It will help your time-feel and harmonic understanding. If you’re a drummer or vocalist, you can use a piano, guitar, electric bass, etc. We’ve got a new look and format here at the Nanoversity of Jazz Pogcast! Each episode, I’ll be reviewing 4, “byte-size” practice exercises. Episode 5 introduces the “Summer Bytes” series (we’ve still got a few weeks of summer left…), with exercises based on bars 12-13 of a common jazz standard. “Summer Bytes” iRealPro track available on Google Drive here (requires app to be installed on device). To download “Summer Bytes 1” cards (samples below), support NOJP on Patreon ($12/month suggested donation, but cards are available to supporters at any level). Feel free to ask questions, request material, and share your own practice exercises. Thanks for watching! In this episode, you’ll learn a 4-minute practice routine for bars 12-13 of “Summertime.” For the last few weeks, I’ve been trying to keep my cat/co-host Lola from dying. She’s doing much better, but it’s really driven home the importance of having a way to practice quickly when life gets in the way. See below for cards (using a fitness deck format), download iRealPro track here on Google Drive, and support the site at Patreon. How to use HIIT/Tabata fitness principles to create 4-minute workouts. Also, learn the solo etude for “Ain’t No Sunflower” (covered in Episode 2 of the Pogcast). Stay tuned for more information about workshops and Skype lessons/consultations! This week’s episode covers the melody for “Ain’t No Sunflower” – a mashup of “No Quarter” by Led Zeppelin and “Little Sunflower” by Freddie Hubbard (with a nod to “Ain’t No Sunshine” by Bill Withers). I’ll post sample Patreon exclusives tomorrow and a related Dear Nano on Thursday, but if you want to be an early supporter, go to patreon.com/nanojazz. Stay tuned for more content – I’m really excited about this series! Update #1: Patreon exclusives for Episode 1 are here. Update #2: Dear Nano for this week is here.